Today’s guests are Ana and Thea from The Book Smugglers, a long-time favorite of mine! These two constantly impress me with both the quantity and quality of their reviews, as well as their insightful commentary and discussions. Their enthusiasm for books and reading just enhances all their wonderful content, which isn’t just limited to their site—they also have a monthly newsletter and write a weekly science fiction and fantasy column at Kirkus. Ana and Thea review a lot of books, both new and old, and they recently started an Old School Wednesday feature dedicated to books at least 5 years old. They’ve just begun a monthly read-a-long for some of these older titles, and they will be hosting a discussion of Terrier by Tamora Pierce on April 24th. During last year’s event, they wrote about agency in fiction and offered recommendations for science fiction and fantasy books featuring female characters with agency. This year, they are engaging in their specialty—making me add books to my wish list in mass quantities—with recommendations for amazing young adult and middle grade SF&F stories written by women! First, let us start this post by saying how thrilled and honored we are to participate in Fantasy Cafe’s annual Women in SF&F Month for the second year in a row! When Kristen invited us to contribute an article this year, we ran through (and discarded) a number of possible topics until we alighted on one that is very close to our hearts. Often times, you’ll hear the dreaded “c” word regarding books under the speculative fiction umbrella: crossover. How many lists have you seen espousing the wonderful, many merits of adult science fiction or fantasy books with “crossover appeal” for younger readers? How many times have you seen articles and posts that cherry pick titles that adults deem are appropriate for younger audiences? We’ve seen plenty. And we want to flip that notion on its head. Today, we present you with our list of female SFF authors who write explicitly for the Middle Grade and Young Adult readers, but whose books transcend age categorization. Simply put, these are awesome authors who create amazing works of speculative fiction. We shouldn’t discount or separate MG and YA from the genre overall when we are talking about great works of speculative fiction. This becomes even more important in the larger context of great SFF and female authorship – because when we talk about women writers in the genre, we are also talking about visibility and recognition. We simply CANNOT ignore the fact that there is a vast (and growing) number of female authors writing SFF for young readers. Also, we should not ignore these titles because, hey, there is so much AWESOME being written in these categories. We’re calling attention to some of our favorites, but you can see our goodreads shelf full of SFF Female Authors and their wonderful MG and YA books HERE. All books on this shelf have a rating of at least 3 stars (or in Book Smugglerish, 6/10), and is meant as a resource for anyone new to SFF written explicitly for young readers. 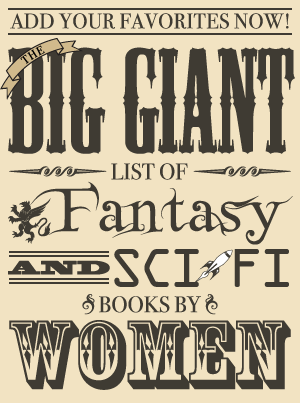 And, because everyone knows about Suzanne Collins and J.K. Rowling and Cat Valente and Kristin Cashore and Tamora Pierce, we’re limiting our list below to lesser-known female authors. These apocalyptic science fiction books are among Thea’s favorites of ALL TIME. Epistolary novels from the perspective of two very different teens in very different parts of the country (one in the isolated countryside, one in the bustle of New York City), these books examine what happens to the world when a catastrophic astronomical event changes the orbit of the moon. Besides having amazingly evocative titles, Ryan’s books are haunting tales of a future world ravaged by the undead. Horrific but surprisingly beautiful at the same time. Bleeding Violet is one of Ana’s favorite books, and Slice of Cherry is one of Thea’s. Both take place in the nightmarish world of Portero, Texas and feature disturbing heroines who are more at home with blood and madness than anything else. Trust us – read the books. Rachel Neumeier is a noted author of adult fantasy, but we adore her YA books even more – The City in the Lake is a darkly romantic fantasy yarn reminiscent of Juliet Marillier and Sharon Shinn, and The Floating Islands features complex protagonists and political machinations on a grand scale (and dragons, too). These delightful, Regency era fantasy books are told from the perspective of one incorrigible twelve-year old named Kat Stephenson. Not only does she have a skill for magic, but she is charged with the tiresome task of saving her older sisters from their own nonsense. We dare you to read these books and not be charmed and amazed. We DARE you. Meredith Ann Pierce is an old school fantasy author, whose work bridges the realms of magical fantasy and science fiction. Her Darkangel trilogy is elegiac and ethereal – while we haven’t this prolific author’s other work, we plan on running through her extensive backlist very soon. We’re going to come out and say it: Kate Milford is one of the most criminally under-read and under-rated authors currently writing books today. Both of her Arcana books are jaw-on-the-floor AMAZING and we vow to do everything in our power to make sure people discover this exceptionally talented author. Don’t know what to read next? READ THE BONESHAKER. Please. DO IT. Another criminally under-read author (at least in the United States), R.J. Anderson is an author of both traditional fantasy and science fiction. Her recent books, Ultraviolet and the newly released Quicksilver are psychological thrillers with a distinctive science fiction twist. Set in a desert world where gods take over the bodies of willing teenage vessels, Vessel is one of those keeper books about coming of age, identity, and choice. This is one of those sleeper books that flew under the radar in 2011 – but it’s one of the best science fiction books Thea’s read in a very long time. What happens when you retell Sleeping Beauty, but add a horrific, science fictional twist? You get some approximation of this masterful book, that’s what. A wonderfully surrealist Fantasy tale of self-identity and discovery that mixes stories from the Caribbean and from Russia. It’s quite unlike anything we have ever read in YA (or anywhere). A brilliant series that gets better and better with each book. Playing with narrative formats in really smart ways and featuring a plethora of unforgettable characters in a Fantasy setting that examines politics and religion, this is one of Ana’s all-time favourite series. Beautifully written Speculative Fiction with a Historical bend and exploring Brooklyn’s incredible, poignant history both now and in the Civil War era, Elliott’s books are always a pleasure to read. Fairytale retellings, Fantasy and Science Fiction: Lo has been writing a bit of everything and always featuring LGBT main characters. Frances Hardinge is another criminally under-read author who everybody with even a remote interest in great Fantasy should be reading right now. Her books are mind-blowing, creative, incredibly thought-provoking and downright fun.